There is pot roast and there is Perfect Pot Roast with Best-Ever Pot Roast Gravy. I have experienced both. Not to brag, but I have always made a pretty “mean” pot roast – even as a newlywed. Shortly after my husband and I married in 1976, my father-in-law, Bob, came for a visit. It was the first meal I cooked for him, and I was both nervous and excited. I decided to cook a pot roast simply because I knew he loved pot roast, but it seriously stretched our $30 grocery budget for the week. For the week prior and the week after Bob’s visit, we reduced our food budget to $25 to make due. The recipe I used included Cream of Mushroom soup and Lipton Dry Onion Soup Mix. It was delicious. My father-in-law enthusiastically told me it was the best pot roast he had ever eaten. Right after complimenting me, he laughed and told me not to tell my mother-in-law, Harriett, what he said. Of course I wouldn’t share that conversation, but I was in Heaven – especially because my mother-in-law was an excellent cook. I used that same recipe for 38 years with rave reviews, but last year I decided to mix things up a bit. I also wanted to incorporate red wine into my pot roast. After testing a few recipes, all of them tasty but not quite what I wanted, I finally came across the pot roast of my dreams. I probably should have called this post Ree Drummond’s Perfect Pot Roast, because this is her recipe. Almost always, 99.999% of the time, I adjust recipes while making them, but this time I decided to follow The Pioneer Woman’s lead into the world of beef. She lives on a cattle ranch so I figured she must know pretty much everything there is to cooking beef. Boy, was I correct! This roast is the BEST-EVER!! I am not exaggerating. I did change the gravy a bit by pureeing together all the yummy goodness in which the roast cooks. I just blended together the carrots, onions, meat juices, wine and beef broth until it came together to make a flavor-filled sauce. 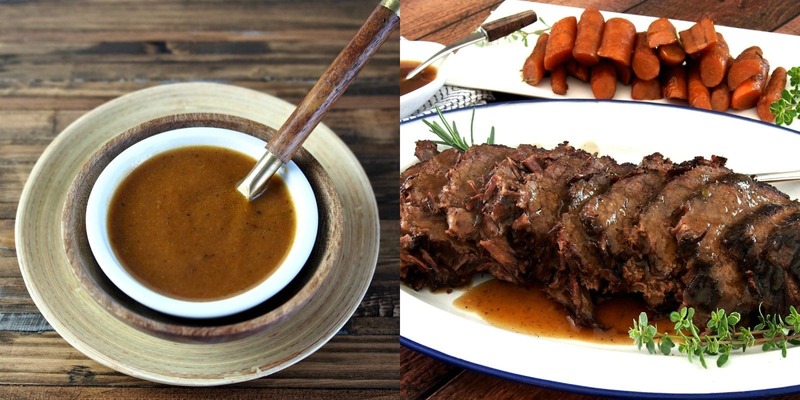 This gravy – this Best-Ever Pot Roast Gravy is to die for – seriously! 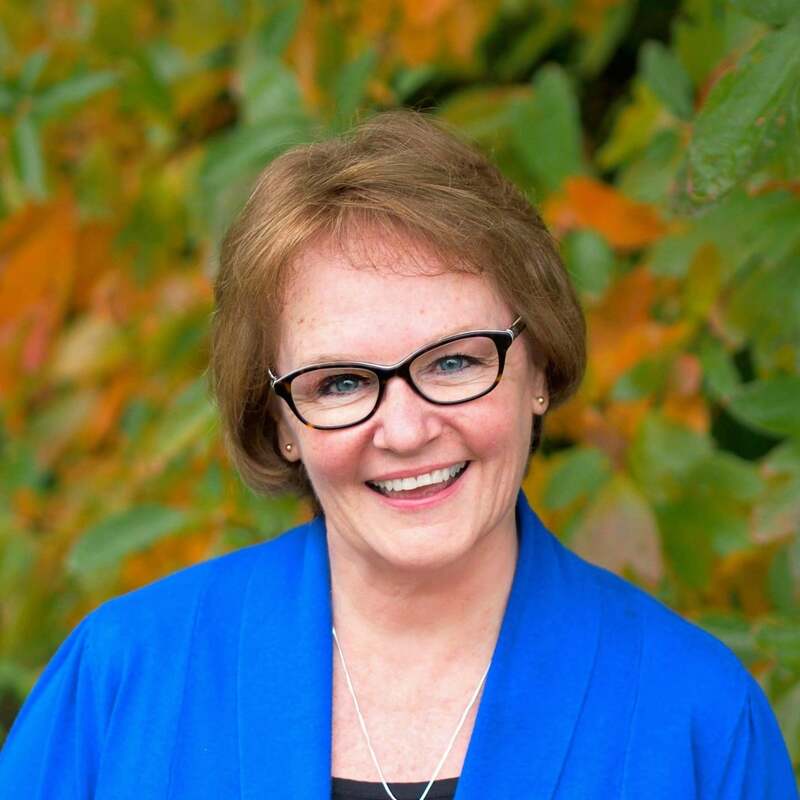 I thank you Ree Drummond – as does my family, my friends, my country and the entire world. I know my father-in-law would thank you, too, and would have loved this recipe. I can only imagine his exuberance after eating this Perfect Pot Roast with Best-Ever Pot Roast Gravy. 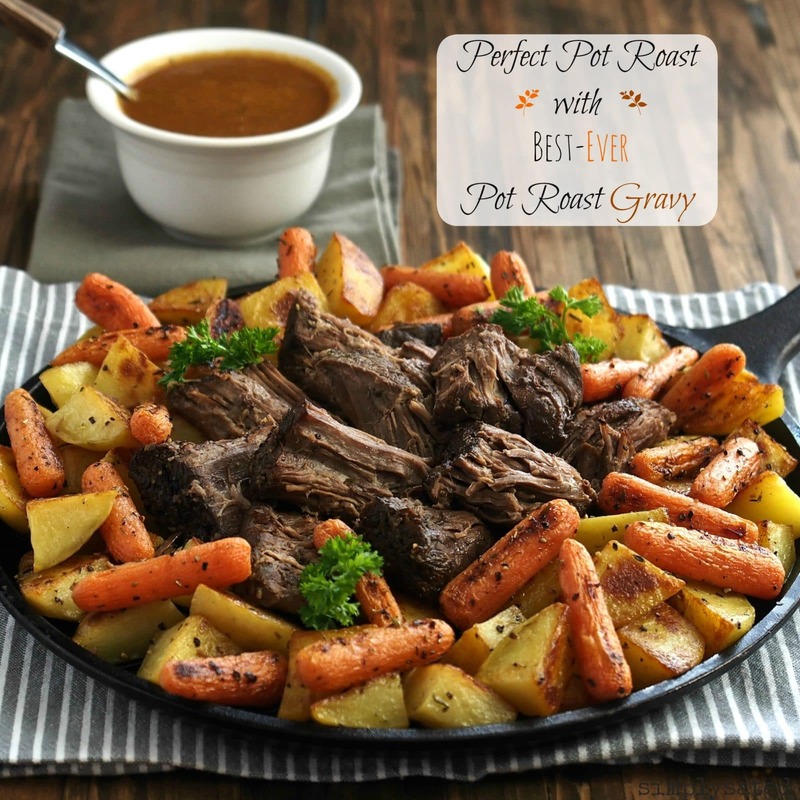 This roast is delicious served with Roasted Potatoes and Carrots or potatoes & carrots cooked with the pot roast. Generously sprinkle chuck roast with kosher salt, black pepper and smoked paprika. Heat olive oil and butter in large pot or Dutch oven over medium-high heat. Place the halved onions in the pot. Brown onions on both sides, remove them from the heat to a large plate. Place carrots in the same hot pot and cook them until slightly browned. Remove carrots from the heat and place with the onions. If needed, add a bit more olive oil to the medium-hot pot. Place the prepared meat in the pot. DO NOT MOVE it or flip it for at least 3 minutes or until it has a nice sear. Turn it over to sear on the other side. Once seared, remove the meat from the pan and place it with the onions and carrots. With the burner on medium-high, slowly pour the wine into the pot. De-glaze (remove the cooked goodies stuck in the pot) the pot by scraping the bits off the bottom while the wine boils. This process is crucial to getting the most flavor back into the roast while it cooks. Once the pan is de-glazed, place the meat back into the pot. Place onions and carrots on top of the meat and add enough beef stock to cover the meat halfway. Place the fresh herbs (or sprinkle the dried herbs) on top of the meat. Place the lid on the pan, then roast the meat for 3½-4 hours or until fork tender. The meat will be fall-apart tender and delicious when done. Remove the sprigs of rosemary, thyme and cooked roast from the pan. Using a hand-blender, immerse the blender into the cooked carrot/onion/pot juices and blend until the desired textured is achieved. I blend the gravy until – almost- completely smooth. This gravy is unbelievably full of flavor. If the gravy is a little on the thin side, stir 2 tablespoons corn starch with ¼ cup cold water then pour the cornstarch mixture into the gravy. Bring gravy to a boil, turn down the heat to a low-boil; stir the gravy until it thickens. (Repeat if necessary). The cooked pot roast and gravy freeze beautifully. Freeze the meat and gravy in separate freezer bags or containers. When ready to serve, either thaw the meat or gravy overnight in the fridge or reheat, covered, in the microwave or oven. It is a good idea to add a little extra beef broth or even water to the meat before reheating. This looks absolutely amazing, I would have to agree, the perfect roast beast! Pinned for later and amazed at your photography too! Thank you for your sweet comments, Debra. I wish I had a big plateful of this roast and gravy for dinner tonight. Thank you also for stopping by Simply Sated today, I really appreciate it. What a great story! Love that this seems to have been your signature dish over the years! This looks simply gorgeous! Thanks so much, Patricia, and thanks for coming by. What a gorgeous meal Susie! Thank you, Nancy, and thanks for stopping by. Hello Allison, I'm sure the recipe would work in a crockpot, but I haven't tried it and would hate to tell you how. You would still need to sear the vegetables and roast in a skillet before placing them in the crockpot. I would suggest you google several crockpot pot roast recipes for insight how to adjust this recipe. I would love to help but, I'm sorry I can't be more specific than this without testing my recipe. If you do, please let me know how it turns out. Thanks so much. Your pot roast looks phenomenal! I am practically licking my computer screen this morning, LOL. Hey Cindy, Your comment made me laugh out loud The actual pot roast tastes even better than the photos look. It is so good. Now, get in the kitchen and make a roast before someone in your family catches you licking your computer screen. LOL!!!! By the way...thank you so much for your sweet comments. 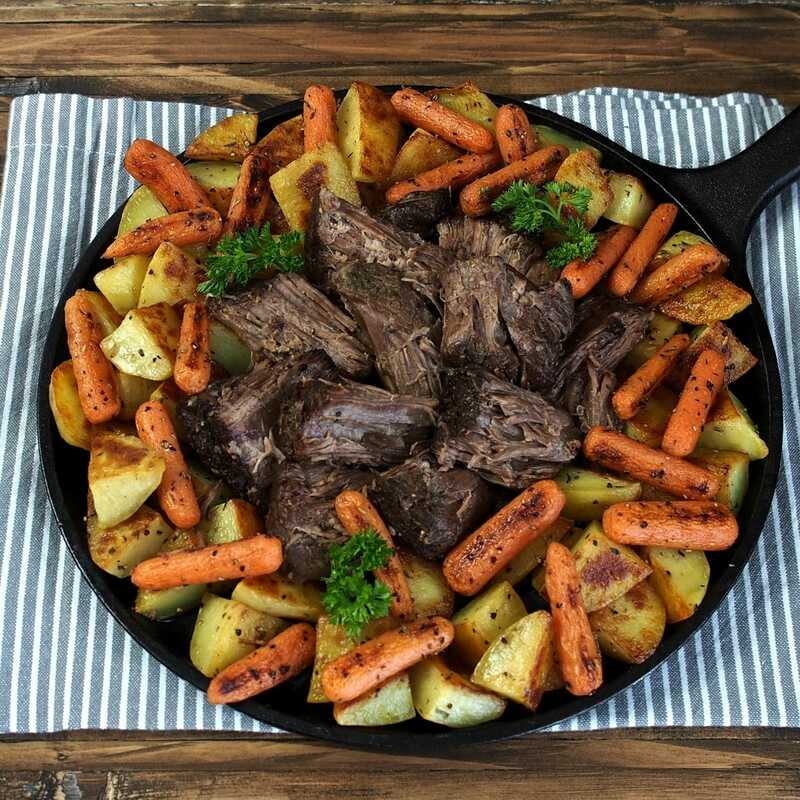 What a stunning pot roast...I can only imagine how great it tastes! Simple and classic have never looked so beautiful. What a grande representation of this plate of Americana; very nicely done Susie! Thank you so much, Dan! Your sweet comments always put a huge smile on my face. What a wonderful dinner! I know for a fact that would be a huge hit at our house! Pinning so I can try this! Thank you, Michelle. You are going to love this recipe by Ree Drummond. It is a hit every time I make it and the gravy is phenomenal. Let me know how it turns out for you. Thank you so much, Erica. This looks phenomenal!! I will be sure to let you know how ours turns out! Thank you Rich. I look forward to hearing how your roast turns out. This looks so yummy. Is there something other than red wine that can be used. Thank you, Elise. 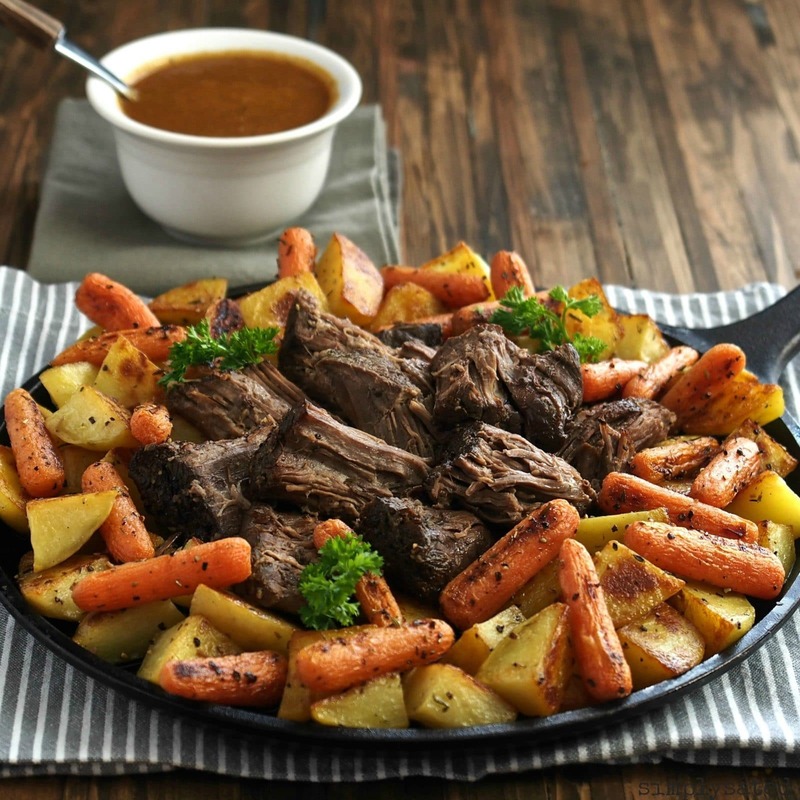 Red wine does add that "something special" to pot roast and almost all the alcohol does cook out, but if you don't have red wine or would rather not use it, beef broth and a couple of tablespoons of good balsamic vinegar can be substituted. Thanks so much for stopping by. Susie, what happens if I leave the wine out? I want to make this for a church event. Is the wine a dominate flavor or is this just enough to enhance that delicious sounding gravy. The Alchohol in the wine cooks out. it just adds depth to the flavor. Vinegar Can work in a pinch,but nothing is the same as adding rEd wine. Id think red wine in a church event meal would be fitting. Hi! This looks amazing. I'm going to make it for friends this week who just had a baby. I will need to make it the day before and dropping it off cold (though not frozen). Any recommendations/instructions about how to reheat it? Thank you! I'm in the process of making this right now but I do have a question. In what part of the recipe does the butter come into it? I read the recipe instructions twice and then when I thought I must be missing it, I had my husband read it and it does''t say where I'm supposed to use the butter.Help?P.S. - I'll rate it later tonight after it's done :) but it sounds and smells delicious as it's in the oven right now. YoJoLo,It calls for the butter in step 4"Heat olive oil and butter in large pot or Dutch oven over medium-high heat. Place the halved onions in the pot. Brown onions on both sides, remove them from the heat to a large plate. "I hope this helps. Heat olive oil and butter in large pot or Dutch oven over medium-high heat. Place the halved onions in the pot. I think step two said heat oil and butter. i PUT IN 2 tbsp WITH THE OLIVE OIL. I finished making this today and I have to say this is the most fantastic pot roast I have EVER made. I've made a lot of pot roasts but none of them ever came close to this one. My pot roast was a little smaller than what the recipe called for (2.75 lbs.) but I used everything in the recipe in the full amount. I halved, small red potatoes in the last 75 minutes of cooking and they came out perfect. Total time I cooked it was 3 1/2 hrs. The meat was so tender it was falling part. So much flavor! I took out all the meat juice with a turkey baster, put it in a fat separator, and cooked the meat juice with a small amount of cornstarch. Just thickened the juice a little, tiny bit. Perfect! I will always use this recipe for pot roast because no other recipe makes a pot roast taste like this. If it sounds like I'm raving about it, I am. Five out of five stars. About to give this a whirl, genius how you pureed the gravy...gonna omit rosemary ..generally add that in when doing a stew, will omit taters too, cause I am gonna make mash taters instead.....Get Ready Set COOK!! I just made this yesterday and it was FANTASTIC! It was so easy to make, too. I really like the idea of pureeing the vegetables and the juices together to make the gravy. It was almost thick enough on its own but I did use a little bit of cornstarch since I had added a lot of broth. I don't have a stick blender so had to ladle everything into my counter top blender but it was well worth the effort. I added some fresh chopped parsley towards the very end. And I might try adding a bay leaf with the other herbs during cooking next time, to see how that tastes. 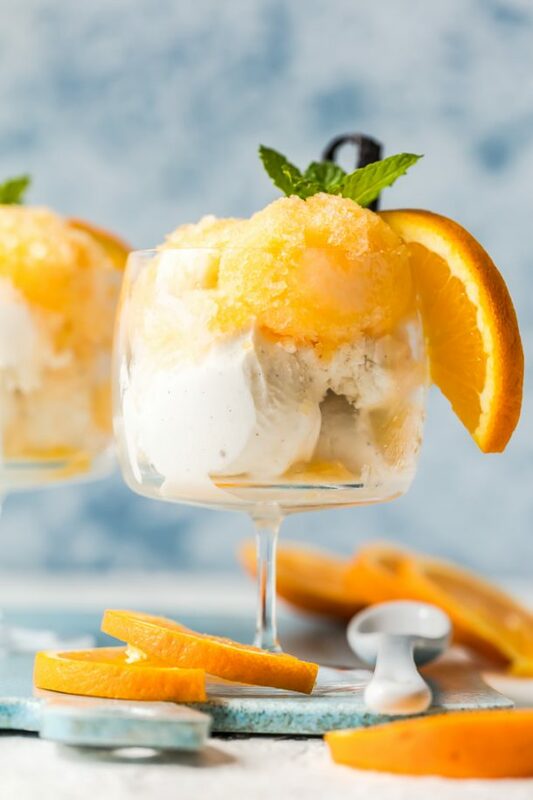 Thank you so much for sharing this recipe, and for the lovely story, and for those gorgeous pictures which are so inspiring! Taking this roast and trimmings to a friend who just got out of the hospital/rehab. I'm going to try to do this just like the pictures if that is possible. Pot roast is such a comfort food, I believe it may have some healing properties. Thanks for this one! Add me to your list of fans - tried this pot roast and it is truly perfect. Thanks so much for the recipe! 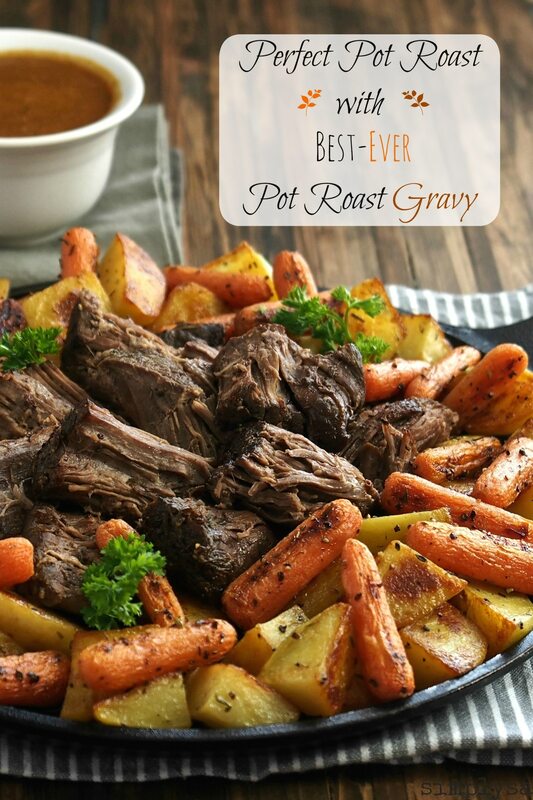 I have loved a good pot roast over the years but I must say this one does look absolutely delicious! I'm going to make this for my fiance because he is a real meat and potatoes man ! Thank you for sharing! Stuart and I have made this three times so far and it is fantastic! Gravy and root vegetables are a must. Thank you for including the extras to Ree's recipe - 'makes a huge difference in the outcome. Great photos, too! Wow, seriously wow! Fantastic. I made this for my neighbors who just had a baby. It was easy to make and absolutely delicious! I sautéed mushrooms with wine in a pan and added them to the pot roast when it was finished cooking. Wonderful recipe. Thank you! Made it. It was great! This was an easy recipe. We particularly liked the gravy. No flour needed. Thank you. I will make this again. That Pot Roast recipe was simply amazing. Thank you so much. I have struggled with making a really great pot roast for years...this just nailed it. You are right that is the most amazing gravy ever. Thank you for writing the directions so clearly....it was a snap. Susie, I hadn't cooked a pot roast before, but I cooked with your recipe for a church occasion. They loved it😋 I didn't tell them about the wine. I don't drink. But in Jesus' time, they drank wine and used for communion and feasts of God. For an encore👍👏, I cooked it again for church. We were blessed by your recipe! I wonder if it is a Kosher meal? May the Lord bless you and may you continue to use your talents for helping others and for His Glory!!! I made this recipe a few weeks ago and it was the best pot roast I have ever had. I noticed that the meat had a great flavor and was well salted, but because I wanted a little extra flavor to it I added a bunch of seasonings(garlic, onion powder, more of the dry herbs listed in the recipe etc) to my gravy and then poured it over my pot roast and let it sit in for a little while before serving. This pot roast was super moist and delicious. I will be making this again. This looks amazing! Going to try and want to add the Additional root vegetables. Is it easy to separate the second batch of veggies from the first batch that becomes part of the gravy? Thank you! Have made Rees pot roast many times but loved your recipe for the gravy. It was perfectly perfect. Hubby was in love!! I cooked this yesterday, but cooked in a slow cooker. Everything was awesome but I really want to comment about the gravy. This is the first gravy I ever made that was an edible one (I'm not good at making gravy). I strained everything out and just used the broth and cornstarch method. This is the best gravy I ever had. Oh and I used burgundy wine, Excellent! Thanks for the recipe. I will always make it this way now. Delicious! I made this tonight for my family and it was a hit! I had a 2.75lb sirloin roast, followed the recipe exactly except didn't have red wine so I just used beef stock. I added potatoes in the last hour of cooking and it was perfect! I cooked it for 3.5 hrs. Thank you for sharing! I'm so glad your family and you loved it Sara. I'm also glad it tasted great even without the red wine. I haven't tried making it that way. I think the wine adds that "special somethin', but very good to know it was delicious without. Thanks for visiting Simply Sated. Have a great evening. jUST HAD THIS TONIGHT, FOLLOWED ALL YOUR RECOMMENDATIONS, AND IT WAS JUST AWESOME. mY HUSBAND SAID, "THIS IS PROBABLY THE BEST POT ROAST i'VE EVER HAD." i DID THE GRAVY WITH THE IMMERSION BLENDER, ADDING A TAD OF CORNSTARCH/WATER, AND IT REALLY IS INCREDIBLE. aLSO, i DID ADD YELLOW POTATOES, 1/2 PEELED, AT 2.5 HOURS, AND WE ATE AT 3.5 HOURS - TOTALLY FORK TENDER, LIKE YOU SAID. 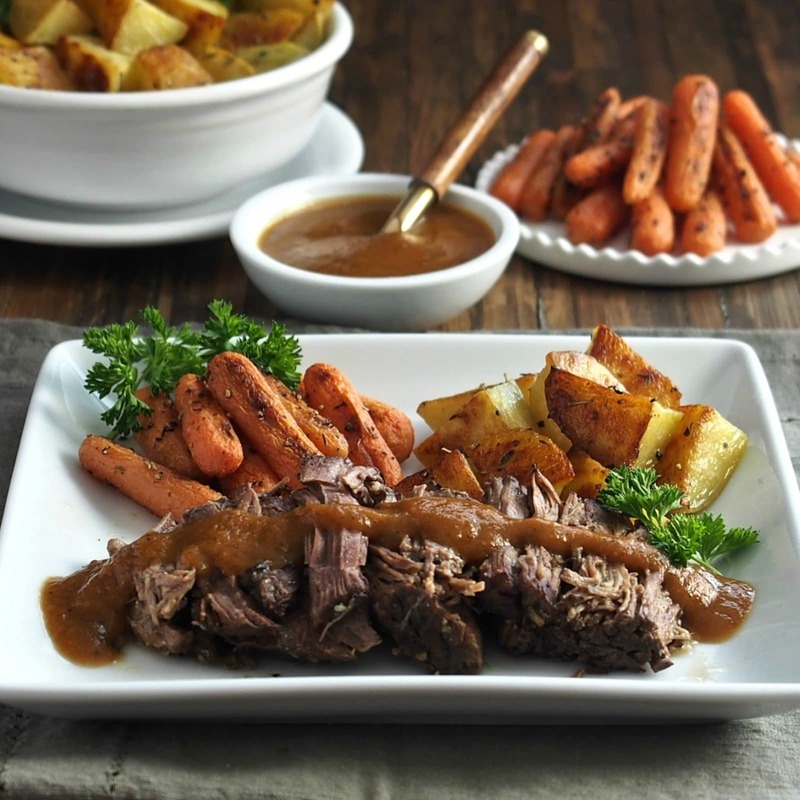 this is, by far, the best pot roast and gravy recipe Ive ever tasted! (Dont tell my mom!) i do have one question. I have a 2 pound roast this time, do you have any adjustment recommendations on cooking time? Hello Tammy and thank you. 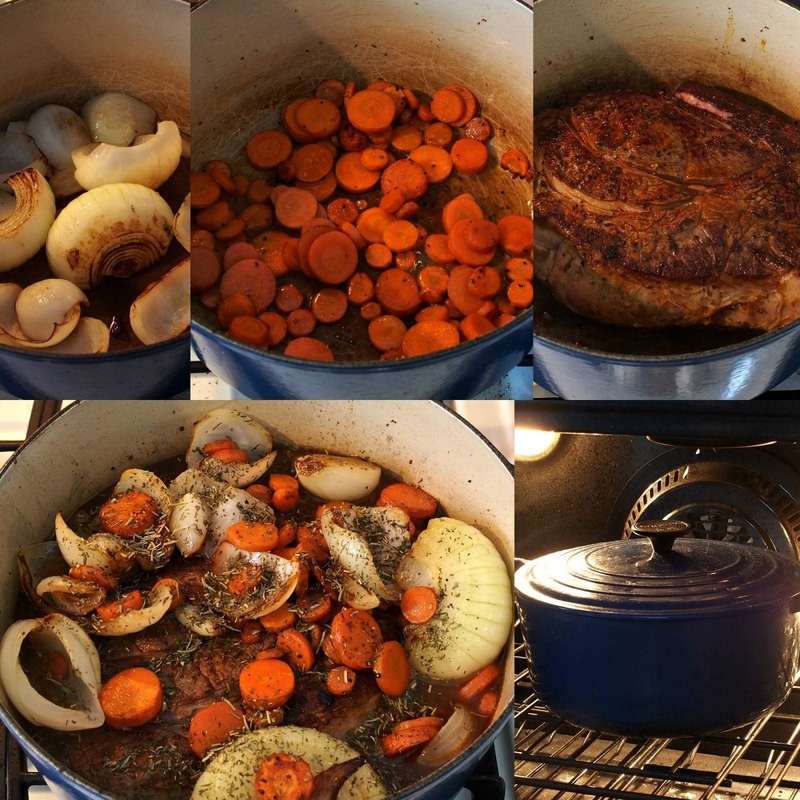 I love this pot roast, too:-) I haven't cooked a roast that small but did a little research. You might cook the roast 2 hours and then add the vegetables and cook it another hour or until the meat is tender. *Note - if the meat is still tough after two hours, turn the heat to 375F for the last hour. I hope this works for you. Thanks again! What kind of red wine? COOKING WINE OR REGULAR? PLS HELP! I always use a good drinking wine. It doesn't need to be expensive, but it should be semi-dry or dry and one that you enjoy drinking. Thanks. Thank you Mary, that is great to know. The pot roast recipe was amazing! The beef was incredibly tender and flavorful. I love onions and carrots and would triple it. Great leftovers too.